Radio 101: Why Do I Hear The Same Songs Over and Over On The Radio? Since beginning my career in radio, there is one question that I've been asked far more than others. "Why does the radio play the same 5/10/15/20 songs OVER and OVER and OVER?" And then that question is usually followed up with ones like "Don't they know there's other good music? Don't the radio personalities get sick of the same songs? Are you the one picking the same songs?" For this month's Radio 101 blog post, I'm going to be breaking down the mystery surrounding airplay, especially in the Top 40 (technical term being Contemporary Hit Radio, or "CHR") format. I work mainly in CHR radio, so my perspective is best on this format, but some of the things that I'll be explaining in today's post could definitely be applied to other formats of "current" radio, like Contemporary Christian or Country Hits radio. I think there is a huge misconception in radio that DJs like myself pick all the songs that play! That couldn't be further from the truth. (Just like you probably were... I was also quite tired this summer of hearing Despacito and I'm The One every 30 mins!) Just about all radio stations these days use computer software that communicates with the broadcasting equipment, and then plays the songs in the day's playlist over the air. To start at the beginning, I'll explain a bit about how music is played on the radio these days. My company uses a music software called NextGen, which is a popular one. This is the same software that I learned how to use in broadcasting school in their studios, so I found this convenient when I began my job! Anyways, NextGen is the program on our station computers that our commercials, songs, and talk breaks are loaded into. It then produces a visual log, and a countdown clock, so that I when I'm live at work I can see the songs and commercials that are up next, what time my talk breaks are at, and how long I have to talk (sometimes it's just a few seconds!). Now you're probably wondering how the music gets into our NextGen program! That's the job of the station's Program Director, which is the radio term for a manager/supervisor/boss. (In larger radio stations or markets, there will also be an Assistant Program Director, or a Music Director, for each station who might be more in charge of music scheduling. But in smaller markets like where I am in Vermont, the Program Director wears a lot of hats!) The PD's job is to schedule each week's music into NextGen or whichever type of software the station uses, and to do so according to industry standards for the type of station that it is. This probably varies from radio station to radio station, but music gets loaded anywhere from a few days to over a week in advance. That means when I come into the studio for work each day, I can have access to seeing the whole log (playlist) for that day, or even upcoming days in advance, as in when which songs will play at what times! DJs can override NextGen's prescheduling to some extent. When I get listener requests, I can move songs around or delete songs so that listeners can hear their requests within the hour. Generally speaking, we aren't supposed to mess with the log of songs that much though.... because of what I'm about to talk about next! So now that you know how music plays at the radio station, let's talk about the actual music! So often in CHR radio (or other formats with their top songs), it seems like only the same 10 songs play over and over and over, with little variety. Radio playlists are made up primarily by what songs are charting high nationally on the song charts in the genre of the radio station, but how do those songs make up the charts and gain popularity in the first place? The charts and brand new music are both influenced directly be record labels, and their reps. Each major artist today that is getting a lot of radio airplay is represented by a huge record label. You might recognize some of the names of the top record labels: Columbia, Def Jam, Interscope, RCA... the list goes on! These record companies (and many more smaller ones) represent the top musicians in the country right now. Selling music and selling an artist is a type of sales job, so the record labels employ reps that work as traveling salespeople, and visit with radio station Program Directors around the country, trying to get them to pick up new songs from their artists that fit the genre of the radio station. The Program Directors for both stations that I work for are visited frequently by reps of the record labels. Considering that I work in a small market all the way in Northern Vermont... I can only imagine that Program Directors in large city markets get visited even more frequently, and that there's even more pressure to play the songs that the labels are pushing! If an artist with the immense popularity of someone like Taylor Swift, Justin Bieber or Rihanna releases new music, you can almost guarantee it will get Top 40 airplay immediately, as artists like these have an enormous presence in the industry and a huge fan base. Songs by established artists like these often don't take long to shoot to the top of the charts. However, it's with newer and up and coming artists where radio airplay can vary regionally. A record label might focus a lot on getting a new artist into certain markets where they think that person would appeal first. For example, Aaron Carter had a comeback album that came out this winter. My boss played the first hit single from the album for a good few months on the main station that I work for, as did a few other CHR stations across the country. However, this song didn't quite chart nationally (although it was a very good song!). There were also a few up and coming artists who you would hear on Charlotte's radio stations- often people who would be brought in to do concerts or meet and greets since that's a larger market. But those artists have since faded and I've never heard them played once in Vermont. It probably means that their record label was heavily targeting Charlotte. Now as far as how often songs are played on the radio- that varies as you can expect by what's big on the charts! The Program Director will schedule music for that day and week by putting what's at the top of the charts in heavy rotation. The top songs in the country (on the radio charts- different from the Spotify/streaming charts) you will be hearing in heavy rotation in CHR radio, usually once an hour with the top five songs. Throughout the day, older, formally popular songs will also play to mix things up, which are either "Recurrents" or "Golds" - depending on their age. A recurrent is a song that was at the top of the charts in the last 1-2 years, so it's something that people are still recently very familiar with. Two recurrents on my station right now are from early 2017- "Let Me Love You" by Justin Bieber and "Rockabye" by Clean Bandit. A "Gold" is a song that's a few years old or even older, a "classic" if you will that everyone knows when it comes on, and that was at the top in its heyday. A few popular Golds in CHR radio are "Yeah!" by Usher, "Toxic" by Britney Spears and "Umbrella" by Rihanna. How often Recurrents and Golds play each day depends on the Program Director and radio company, and the flavor of the station. Before my station relaunched in August, we were playing a lot of brand new music and more recurents, but less golds. Now with our rhythmic hip hop lean, we play two golds an hour! I don't remember the station that I interned for in Charlotte playing that many golds at all, but they were a large market. 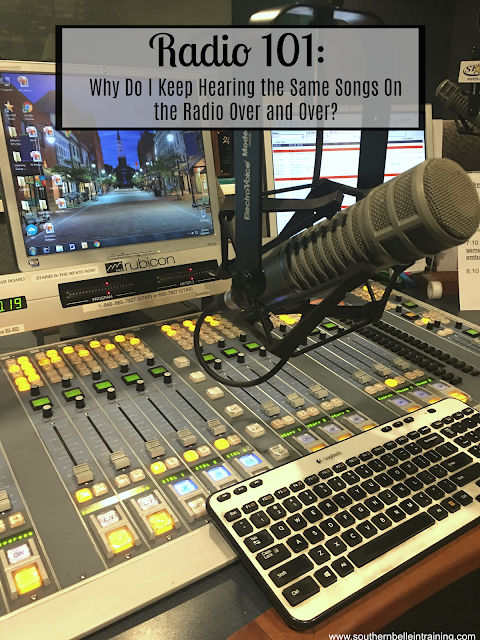 Sorry if this post is a bit wordy- but I hope that it helped you to understand a bit about the mysteries of why some songs play more than others in certain genres of radio! Even though I went to broadcasting school last year and had radio internships, a lot of the record label politics and such were things I didn't learn about until starting my job this spring. I hope most of all what comes across through these monthly Radio 101 posts is how much I love the field of radio and love sharing what I know and work with everyday with others! Feel free to send any radio related questions for next month's Radio 101 post! Have a wonderful weekend! This is so interesting! Love the behind the scenes info. Is your station on iHeartRadio? Would be cool to listen to your show! Hey Hannah!! 😊 The company I work for isn't affiliate with iHeartRadio, BUT you can listen online at www.thenewhot967.com!! Would love to have you tune in! I often ask this question too! Thanks for clearing this up! Annaliese, this was SO interesting to read. I had no idea that this was how the songs were picked to get played on the radio. Thanks for sharing, loving this series! This actually answers some of the mysteries! Very interesting to read. I didn't know all that was behind radio stations! How interesting! I've always gotten annoyed with the song choices haha. It's so interesting to hear more about how radio works! Can't wait for the next post! Hmm...this is quite interesting for sure. I had no idea how any of this worked. Such an interesting and informative post!!! This was so cool to read about! I always tune in to my favorite radio station where I'm from and I've always wondered how they decide which songs to play and when. I loved learning about "recurrent," "gold," and "classic" songs - so interesting to hear radio lingo! Great post, Annaliese! I loved reading this! As a total consumer and radio listener, I never knew a LOT of this! So interesting - hearing your perspective is awesome! This is so interesting! I had no idea that DJ's don't have full control over what songs are played.